Great Britain’s young team finished ninth in the Team Free competition on the second day of synchronised swimming at the Glasgow 2018 European Championships. The team scored 78.9333 for their routine at Scotstoun, securing the second top 10 finish of the competition after Kate Shortman and Isabelle Thorpe’s 10th in yesterday’s Duet Tech. The Brits’ score was an improvement from yesterday’s prelim, where they progressed in ninth on 78.3667. The team comprised of Millicent Costello, Greta Hampson, Cerys Larsen, Daniella Lloyd, Daisy Rushton, Harriette Smith, Abigail Taylor and Victoria Usher – the same eight swimmers who have impressed to place ninth at the European Juniors and 12th at the World Juniors earlier this season. Shortman and Thorpe also returned to action on day two, securing their progress to the Duet Free final. The pair – who finished 16th in this event at last year’s World Championships in Budapest – scored 80.9667 to qualify in 11th. 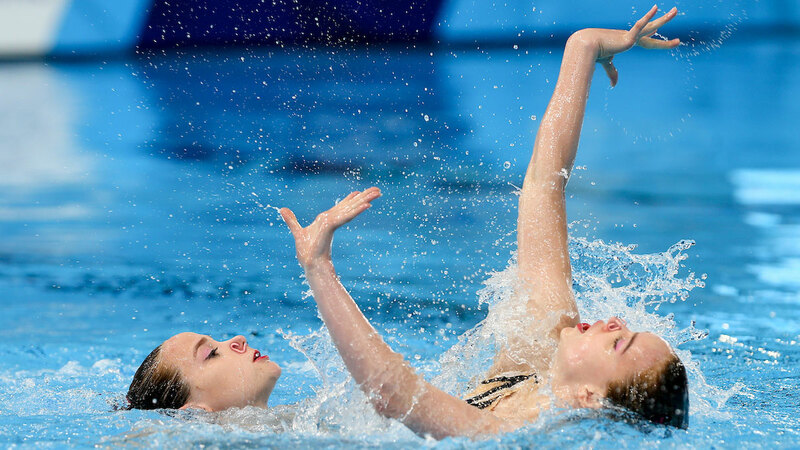 “The team had a much better swim than in the preliminaries,” said Swim England Synchro manager Karen Thorpe. “All the lifts were improved, the patterns were tighter and clearer, and the last lap was the strongest of the routine. We’re pleased, although disappointed with the scores. “We’re again disappointed with the duet score, which seems a bit harsh and is nearly three marks lower than at Junior Worlds.